The city of Columbia was founded in 1786 in central South Carolina. This site was chosen as a deliberate alternative to the previous capital at Charleston, which was considered vulnerable to assault from the sea. 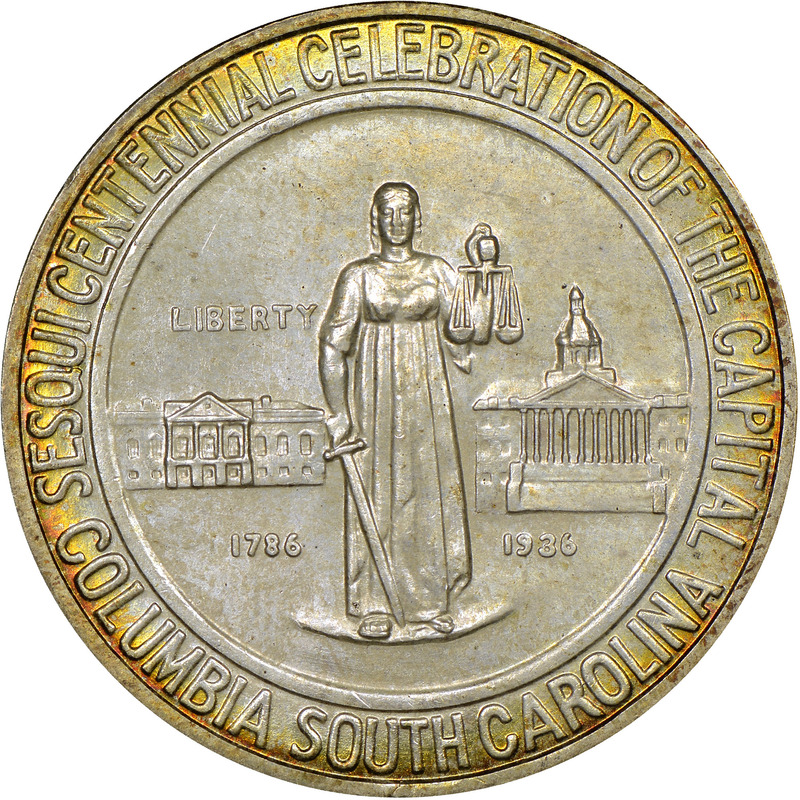 In celebration of the city’s 150th anniversary in 1936, the Columbia Sesquicentennial Commission sought to strike commemorative coins. The Act of March 18th, 1936 authorized the striking of up to 25,000 half dollars at “the mints;” verbiage which allowed for 3-coin sets to be issued. The Sesquicentennial Commission selected a local artist from Colombia’s Clemson College to design the coin. Scultpor A. Wolfe Davidson’s initial attempts were not accepted, and the Commission of Fine Arts had to work with the artist to make major changes. In the end, his models were deemed satisfactory, and were approved on July 22, 1936. Davidson’s obverse design features a standing, facing figure of Justice, flanked at left by the Old State House of 1790 and at right by the New State House built between 1855 and 1907. Below these in small numerals are the dates 1786 and 1936, respectively. Also in small letters, the motto LIBERTY appears above the Old State House. 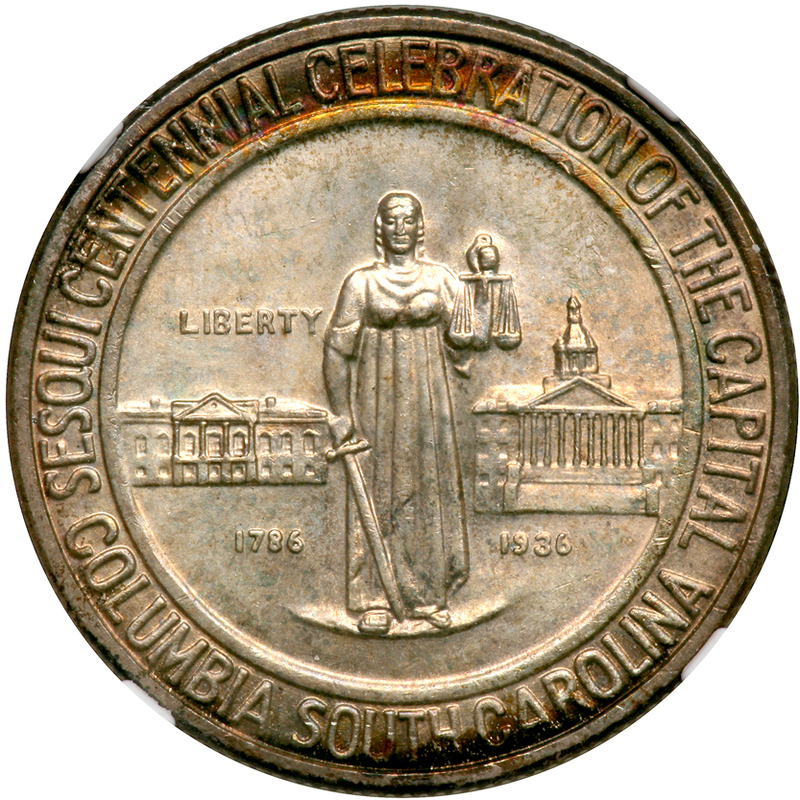 Arranged in arcs around the periphery, within an inner and outer border, are the inscriptions SESQUI CENTENNIAL CELEBRATION OF THE CAPITAL and COLUMBIA SOUTH CAROLINA. The reverse of the Columbia half is dominated by the state’s symbol, the palmetto tree. Below it is a broken limb of oak, meant to symbolize the victory of South Carolina’s native palmetto (which formed the walls of Fort Moultrie in Charleston) over the oaken timbers of King George’s ships. Arranged in arc form within an inner border are 13 stars, indicating that South Carolina was among the original 13 colonies and states. Above the tree is E PLURIBUS UNUM, to its right IN GOD WE TRUST, both mottos required by law. 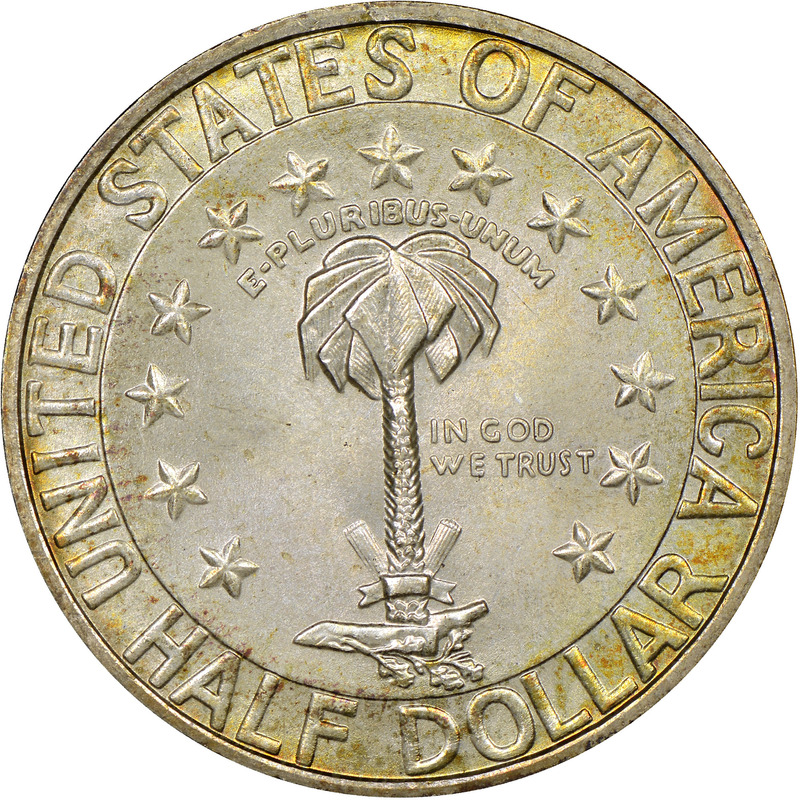 The legends UNITED STATES OF AMERICA and HALF DOLLAR are arranged peripherally between the inner and outer borders. With so many commemorative coins in 1936, it took until mid-October for all 25,000 coins to be struck. Philadelphia struck 9,000 pieces, while Denver and San Francisco each struck 8,000. While many commemorative coins of the era ended up in the melting pot, that was not the case with these coins. 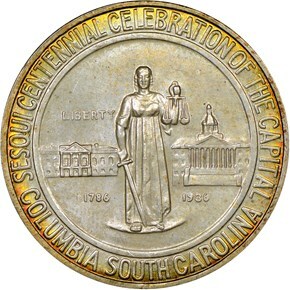 In fact, the Sesquicentennial Commission was oversubscribed by 15,000 coins! In order to distribute the coins fairly, only small orders were filled, and all coins were distributed by the end of the year, mostly to individual collectors.